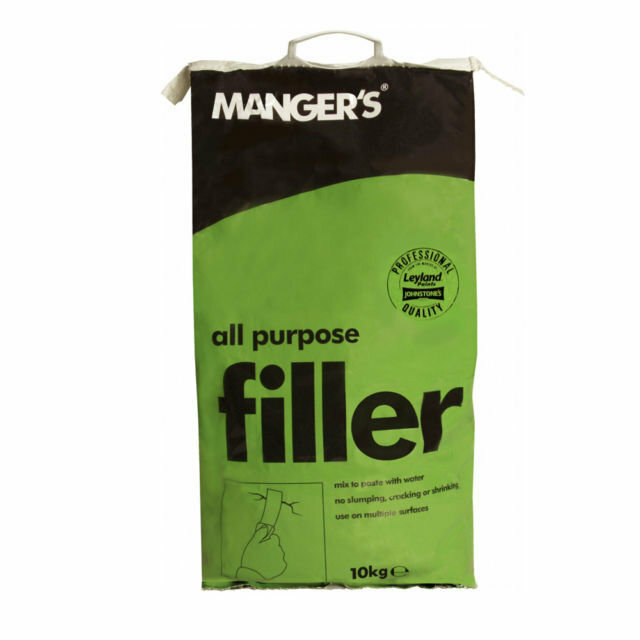 Mangers Instant Mix All Purpose Filler : - is ideal for repairing and filling cracks, gaps and holes in most common surfaces inside and out. It dries to a tough surface that is smooth and easy to sand and is so strong that it will take screws and nails when fully set. Add 1 part water to 2.5 parts of Mangers Instant Mix Interior Filler and mix throughly to a smooth paste. Use a stiffer mix with less water for wood, large repairs or vertical surfaces. Filler remains workable for approx 1.5 hours after mixing. Push filler into the repair using a filling knife or trowel. Allow each layer to dry thoroughly before applying the next. Smooth the final layer with a wet filling knife.